On yet another uncomfortably hot day most of the bird interest was on the sea, with 35 Common Scoter, 12 Mediterranean Gulls, 7 Black-headed Gulls, 5 Manx Shearwaters, 5 Sandwich Terns, 3 Yellow-legged Gulls, a Whimbrel and a Common Gull through or lingering off the Bill; 5 passing Sand Martins were the only migrants of note on the land. 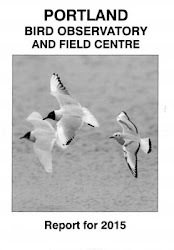 The only other reports were from Ferrybridge, where there were 33 Mediterranean Gulls, 15 Dunlin and a Redshank. A fuller report on recent mothing to follow tomorrow - it's been so busy/time-consuming that we've lost track of all the island rarities we haven't reported yet!